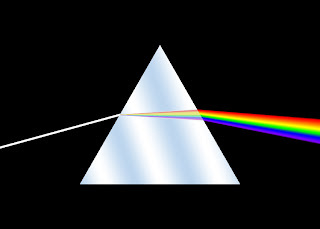 When white light passes through a prism, the different frequency components of the light refract at different angles, creating a rainbow effect. Real rainbows you see in the sky are caused by sunlight being dispersed into separate colours by moisture in the air, which has the same net effect as a prism. A simple way to imitate this effect in a shader is to create three refracted rays, one for each component (red, green and blue) of a fragment. Using slightly different indices of refraction for each ray creates an effect like dispersion. The difference is that in reality the frequency spectrum is continuous. 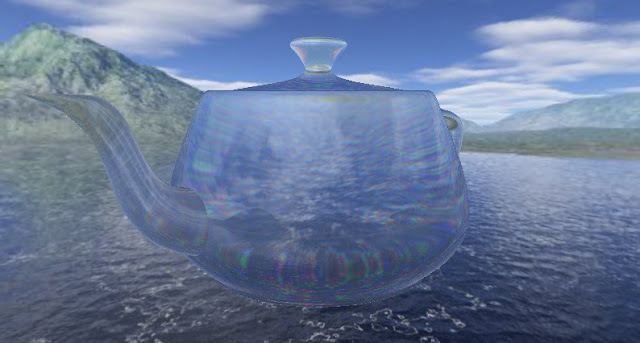 This example builds on a refraction shader discussed in the OpenGL 4.0 Shading Language Cookbook by David Wolff. Chromatic dispersion with reflective component.